The technical for this piece can be found here. 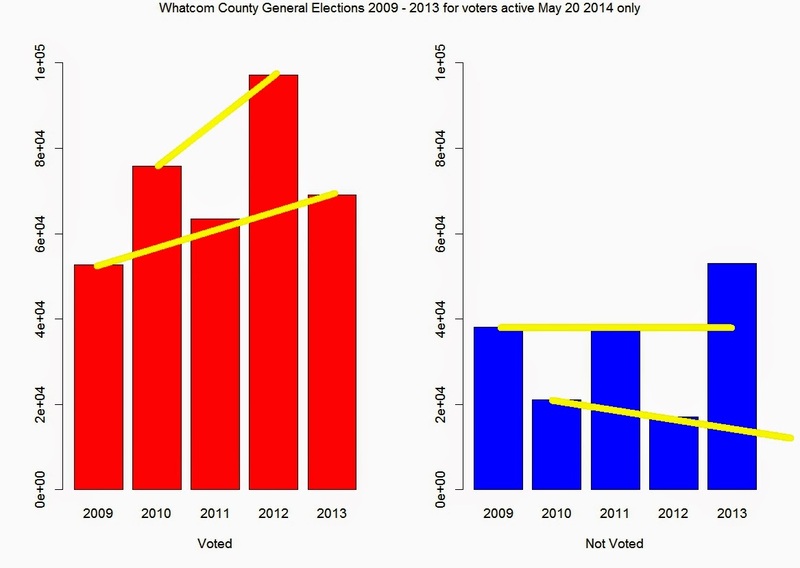 The charts below explicate five years of general election in Whatcom County for voters registered as of May 20,2014. This means that we are looking at election turnout numbers only for those people currently registered to vote as of May 20th, 2014. 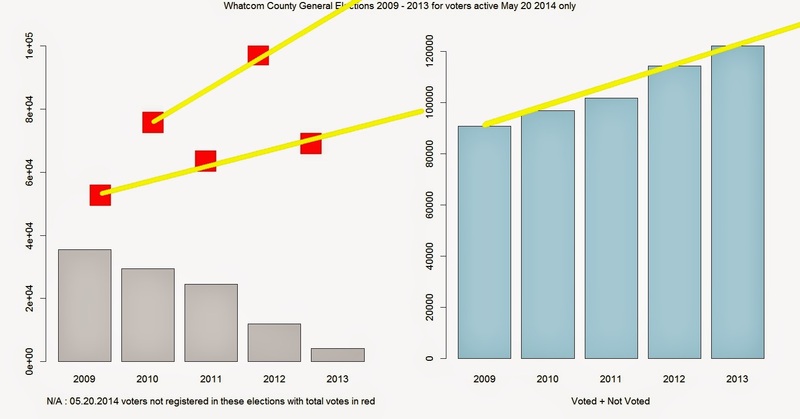 As of May 20th, the voter database for Whatcom County stood at 126283 registered voters. I duplicate four sets of graphs with analysis. Click on these graphs to enlarge. General Elections 2009 - 2013 for voters registered as of May 20, 2014. Chart 1 shows votes increasing at different rates for odd vs. even (major vs. minor) election years. 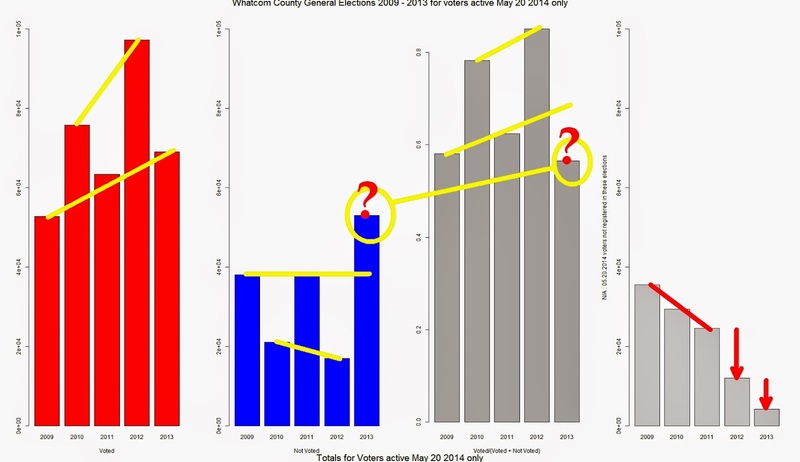 Chart 2 shows consistency for those not voting in odd and even years except for the 2013 election where there was a marked increase in registered voters not counted (e.g. "not voting"). Chart 3 gives corresponding percentages of those did vote (turnout). Chart 4 shows those from this active voting list not active (registered) in previous years. Let's do this in pairs. Below we compare voted vs. not voted numbers. Clearly the last five years have shown substantial increases in voting. The rate of increase looks high enough to exceed any 1.5% yearly population increase, but I don't know that for sure (yet). The odd years (or off years) don't feature Presidential, Congressional or County elections. For those even years, turnout rates (in blue) are on an astronomic climb and a corresponding continuing decrease in those not voting. Those not voting in 2013 represent an anomalous number in comparison the the previous odd years (2009,2011). Remember in all of this analysis we are looking at a database of only active voters as of May 20, 2014. So the light blue columns below right don't correspond to the registrants active for each of those years. Instead, these are the voters that are registered now who will probably be part of the voting pool in November. The chart below left effectively contrasts the then active registrants with the periods in which current voters they were not active registrants. Astonishingly, the gap for 2009 in that chart is very narrow; a possible indicator that our voter database has had extensive turnover in five years. The sum for the gray bars of the then non-registrants (but now registrants) is 105,768. This total is 84% of the currently registered 126,283. 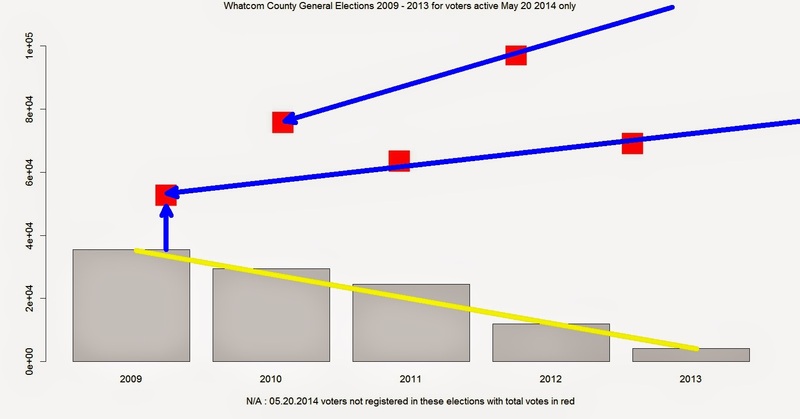 I am struggling right now to understand why this number wouldn't mean that we have turned over 84% of our Whatcom County voter database inside the last five general elections. More exciting, in-depth voting analysis to come voters. Hang on to your top hats and make sure that you are registered to vote.